Take a break from smuggling goods with Chewbacca to transport Obi-Wan and Luke to Alderaan in our sleek Han Solo costumes. 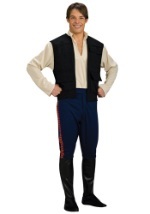 Perfect for Star Wars conventions, dress-up play clothing, Halloween costumes, or teaming up with a friends dressed as Princess Leia and Chewbacca, our Han Solo costumes are available in child and adult sizes and standard or deluxe styles. Pair Han with Princess Leia this Halloween for a great Star Wars couples costume!